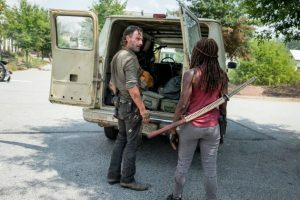 Rick and Michonne are trying to move forward after burying Carl. Negan is pissed! Simon is pissed! 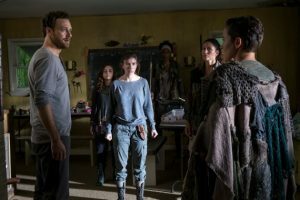 Jadis is lost and Aaron and Enid have a difference of opinion. Overall, more of a set up episode for the finale. This is the worst subplot of the season. Why Aaron thought the most important thing was to drive to Oceanside and ask for their help when they just attacked them and stole all their weapons is beyond me. I guess it was just to give them something to do. Things went as expected. 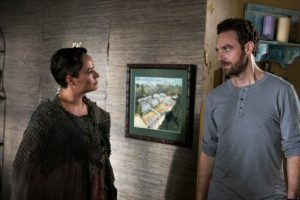 Enid talked her way out of getting killed but, for some reason, Aaron decides to stay behind because he thinks he can convince them to change their minds. My guess is he will but this is just a throw away storyline. 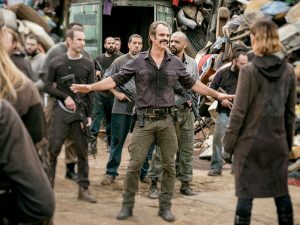 Simon tells Negan they should kill Jadis and her garbage people but Negan didn’t want to. He wanted to stick to their protocol; kill one as an example and get them back in line. They received Maggie’s zombie-gram. Simon opened the coffin and Negan using a nail gun to put zombie Dean out of his misery. Simon shows up at the junkyard and confronts Jadis. He kills her right-hand man, Brion but doesn’t stop there. He shoots another one and then his bloodlust takes over. He gives the order to kill them all! He is openly defying Negan and this does not bode well for Simon. I did not expect this, but seeing how unreliable the garbage people have been, this is no big loss. 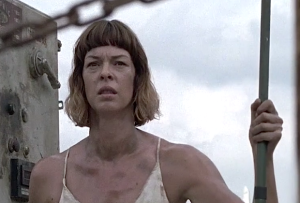 Also, did you notice that Jadis started speaking normally? Their affected way of speaking was just their way of adjusting to the post-apocalyptic world they found themselves in, just as Ezekiel adopted the manner of a ‘king’. 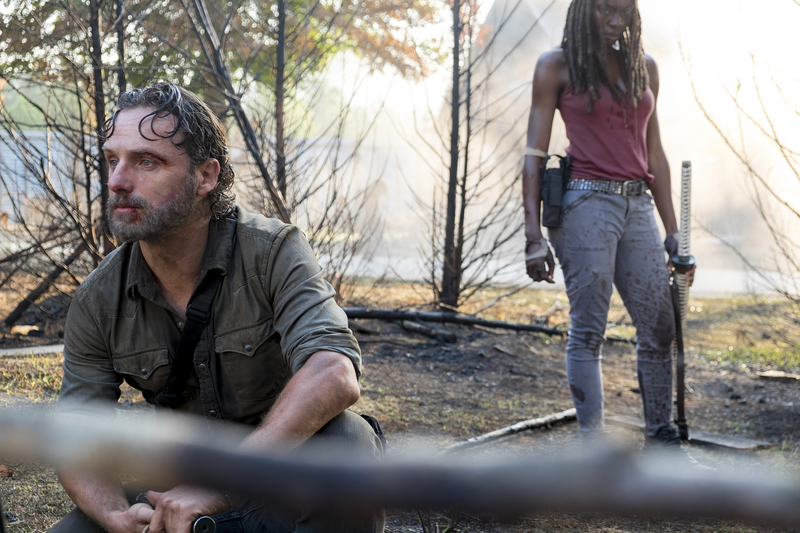 Rick and Michonne say their goodbyes to Alexandria. Michonne looks at the hand prints that Carl and Judith left on the porch of their house. Rick packs up some belongings and they load up the van and hit the road. Rick, for some reason, wants to appeal to the garbage people yet again! The only reason for this is so that they can discover that they have all been wiped out and are now a horde of garbage walkers. But apparently, Simon left Jadis live. I guess that was her punishment. When they find her, she’s wearing a white slip. Not sure why, perhaps that was her mourning gown? She begs for them to take her with them but Rick, coldly, says no. 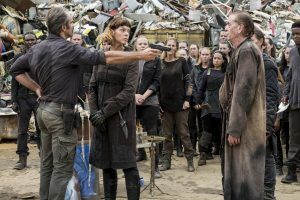 Rick and Michonne fight their way out and leave Jadis to her own devices. I thought she was done but she came up with a very clever and grisly way to survive. She lures them to a grinding device and one by one they fall into it and are thoroughly ground up into ground chuck! A conveyer belt of red meat empties into an open hole. Chili is served! This was a pretty awesome new way to kill zombies! She may have broken Rick and Daryl’s walker kill record in one episode! As Rick and Michonne drove away from the junk heap, Michonne looks at the letters that Carl wrote. She sees an envelope labeled “Negan”. Rick pulls over, takes the letters and goes for a walk. He opens Negan’s letter and reads it. 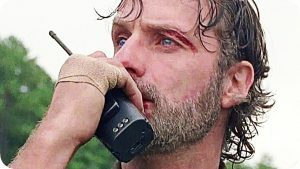 He then gets on his walkie talkie and asks to speak to Negan. He tells Negan that Carl is dead. Negan is visibly upset by this news. “That kid was the future”, he tells Rick. Rick only sees vengeance no matter that Carl pleaded for peace in his letters. Negan really lets him have it in a very calm and non-Negan way. He tells Rick that it was his fault that his son was dead and that he was a terrible leader who is always getting those he loves killed. Man, that hits hard. Over the years, Rick’s judgement has been suspect. He can’t deny that his decisions have led to many deaths. How will Rick take this? This was a great scene and certainly a great way to end a so-so episode. The episode tried to be like a Tarantino film. Scenes began with title cards like “Michonne”, “Enid” and so on. It didn’t really add up to anything and just seemed to be someone’s cute idea to do something different. They play around with time a little as well. There are too many characters! At least they got rid of all the garbage people but that still leaves Jadis. Next week, we’ll probably see Eugene, Gabriel and Negan + Daryl taking everyone to Hill top. I think they need some new blood in the writer’s room. 1 Aaron will get Oceanside to help. Ho hum. 2 Negan will kill Simon for disobeying orders. 3 Eugene will switch sides again! 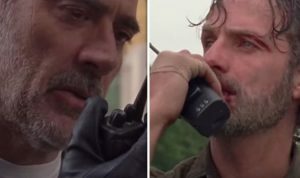 5 Rick will come up with yet another scheme to take down Negan and The Saviors. This one will work and he will NOT kill Negan!